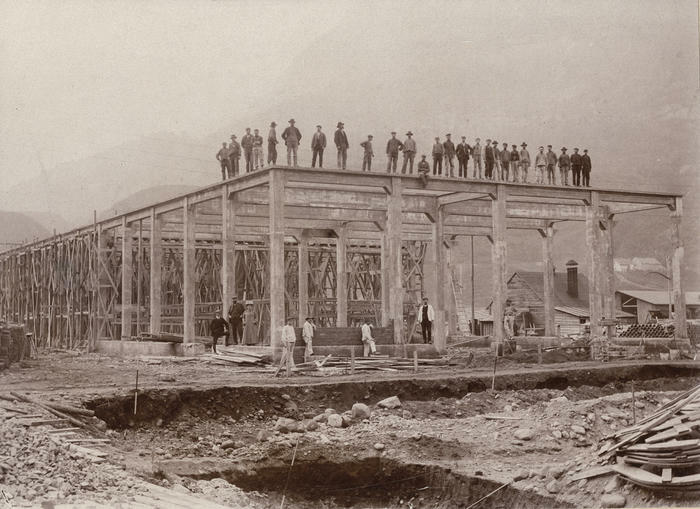 Odda’s pioneering industrial history, which began at the end of the 19th century, is key to understanding the industrial history of Norway as a whole. The industrialization was emerging in Europe, and the energy-intensive industry was looking for a profitable way of production. Water became a key resource for building the modern Norwegian welfare state. 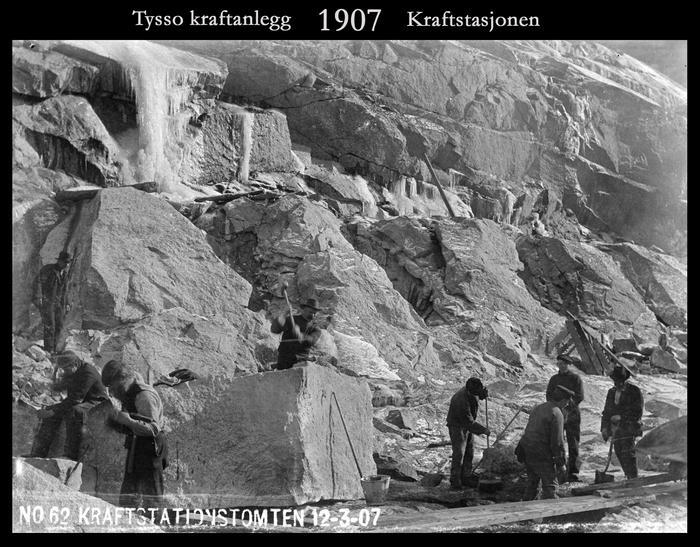 And Tyssedal was one of the pioneer sites in the development of hydroelectric power. In the course of just a few years, Tyssedal developed from a farming district to a modern industrial community complete with housing developments, schools and social services. The developer engaged the leading architects of the time and planned everything from quays, factories and electrochemical ovens, to greenhouses and lifestock barns. There was even a midwife service. 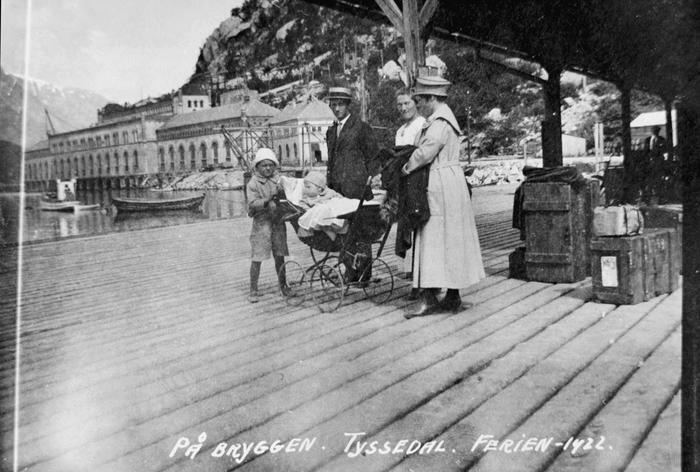 But before that, adventuresome foreign travellers and tourists had sought out Tyssedal in the mid 19th century. Friedrich Engels was neither the ﬁrst nor the most prominent foreigner to visit Odda. Foreign travellers found their way to Hardanger as early as the 1830s. Later, Germany’s Emperor Wilhelm II would return here year after year. One of the most coveted job titles in the Sørfjord district was ‘imperial pilot’. 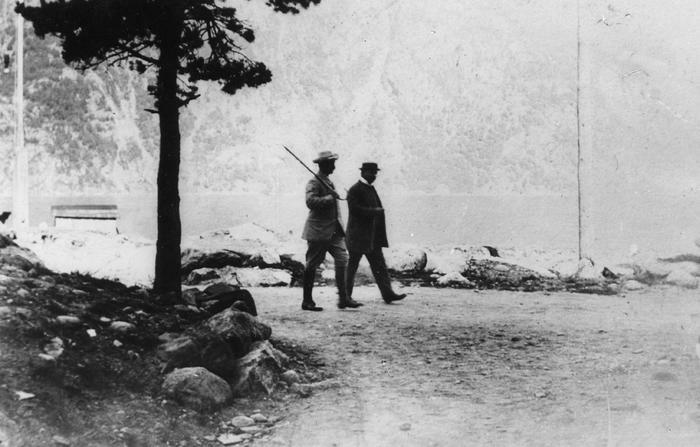 A photograph from 1906 shows Sam Eyde explaining to Emperor Wilhelm II the development plans that were to end a period of exclusive tourism. Up until then, tourism had blossomed; by 1900 Odda had 10 hotels to house travellers, the oldest of them more than 50 years old. One of the hotels had 110 rooms, the largest hotel and in fact the second largest wooden building in Norway. 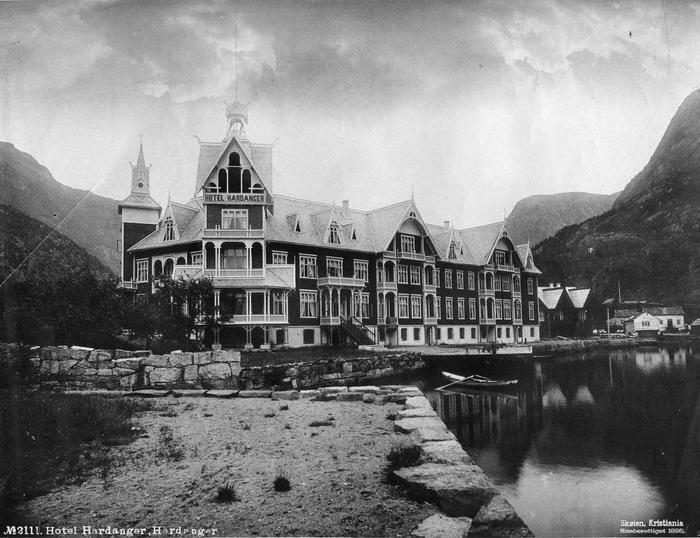 The magnifienct Hotel Hardanger - rebuilt after a fire in 1895. Photo: Kraftmuseet archives. But the industrialization that came, soon made these dimensions seem small by comparison. The construction of the carbide and cyanamide plant was one of the largest undertakings of its kind in the world. The building permit was given on 25 January 1908; by the end of the year, both parts of the plant were fully operational. Construction projects brought evermore people to Tyssedal. In just a few years the popluation rose from 30 to more than 1000. 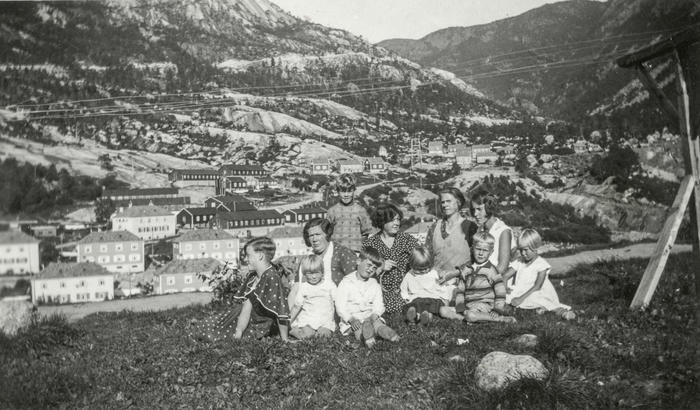 The 75th yearbook of the Odda Labour Association tells us that: “Almost every village and town in Norway was represented in this inﬂux of migrant workers. The resulting confusion was not merely a question of language and dialects. Everyone brought his peculiar customs, habits, and ways of thinking. The town of Odda was simply too small to absorb all these new impulses and give them root in its agrarian culture. Politically, Odda was a socialist bastion, reﬂecting the radical tendencies of the labour movements of the time. Socialists and communists may have dominated politically, but it was the haste and chaos of the construction sites that had the strongest inﬂuence on people’s life styles and social life. Odda’s vigorous development became known far outside the region of Hardanger.Here the migrant worker, the adventurer and the opportunist lived side by side, alongwith the many who aspired to join them. They all seem to speak Swedish – the farm boy from Ullensvang as well as the ﬁsherman from Vesterålen in the far north, whether they work on the Zink, the Nitrates, the Carbide or the Cyanamide. A story from Edvard Bull’s classic collection from these early construction years tells of a syndicalist who gave up Odda after a brief spell. He had just ﬁnished working on the construction of the Bergen railway and joined four other men headed for Odda. There was known to be plenty of work and the pay was good. All ﬁve of them got jobs immediately at “the Cyanamide”. They were given quarters by the company – to be deducted from future wages, of course. The syndicalist was assigned to the crushers, reckoned to be the worst task in the whole plant. They protected themselves as best they could with dust masks, leather gloves, and cotton wrappings around their neck and wrists. But it didn’t really help. The dust found a way to penetrate and soon their skin was marked with sores. The company offered loans so workers could move their families. But the syndicalist simply found this work too rough. Soon he’d had his ﬁll. The production continued 24 hours a day on 8 hour shifts, weeks and weekends, even Christmas and Easter. Seven shifts a week for each worker, with double pay granted during the holidays. The syndicalist as well as many others quit right after Pentecost, pocketing two days of double pay.